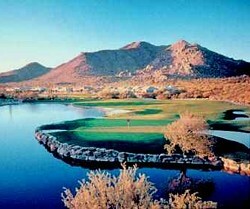 Terravita in North Scottsdale is a 24 hour guard gated Del Webb Corporation community development in the beautiful high Sonoran Desert with Black Mountain to the north and The Boulders to the east. Terravita offers a private 18-hole championship golf course and Country Club. All residents enjoy the use of the Fitness Center, Pool, Tennis and Desert Pavilion – Community Center. Terravita has a Social Membership that is inclusive of property ownership, Terravita’s Golf membership is separate but available.